Description: CN 5604 leads CN 321 through Kingston Ontario as it passes its counterpart. Description: CN 397 meets CN 398 at the bridge just west of Durand. Description: CN 397 approaches the signals on track one on its way west. Description: The crew is wying the power so CN 5604 will lead the transfer out of town today after the IC was have problems with its brakes. Description: Roster shot of CN 5604 as it waits to head down to Northtown Yard. Description: Southbound CN Mixed Freight through Centralia IL. Title: CN 5604 at Mile 68.52 Dundas Sub. 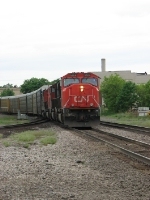 Title: CN M39671 East at Durand.